I have a soft spot for vintage recipe books, especially ones with retro artwork and dated designs. 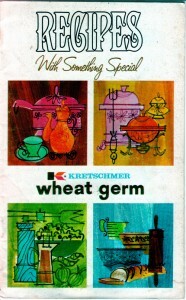 This little gem from 1968 was a promotional recipe booklet for Kretschmer Wheat Germ. This cookbook has it all… ugly colors, funky artwork, and recipes I might actually use! “Recipes With Something Special” features more than 60 recipes that all include something special… Kretschmer Wheat Germ, of course! 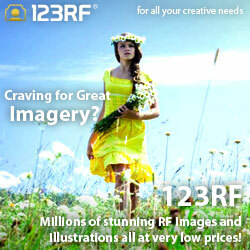 Recipes cover breads, main dishes, salads and vegetables, desserts, and beverages and snacks. This cute little recipe booklet also offers helpful hints and ideas “for adventurous cooks,” as well as facts about and nutritious benefits of wheat germ. Maybe because I’m a child of the ’70s, and my mom went through the same health food craze that all mothers did at the time, but I do actually like wheat germ. Wish I could say the same for carob and all-natural peanut butter. Browse through the entire recipe book below (17 pages including the cover), or download the PDF here for FREE, courtesy of the kitschy kitchen at Quarter Moon!